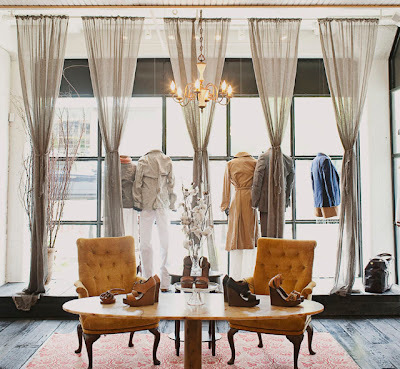 Another book I'll be covering in the next few days is designer and shop owner Nathan Turner's debut release. Whether he's pulling together a room or a cozy dinner party, Nathan has a distinct talent for channeling certain vibes -- could be Bloomsbury or California Ranch -- without getting too theme-y. Shown above is an African design appreciation moment. 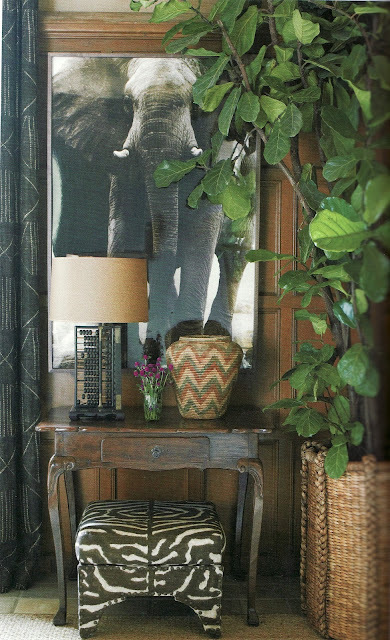 Here he mixed a 19th-century patterned African basket and vintage African textiles (not really visible in this picture) with Amber Arbucci's elephant photograph and a Ralph Lauren zebra fabric. 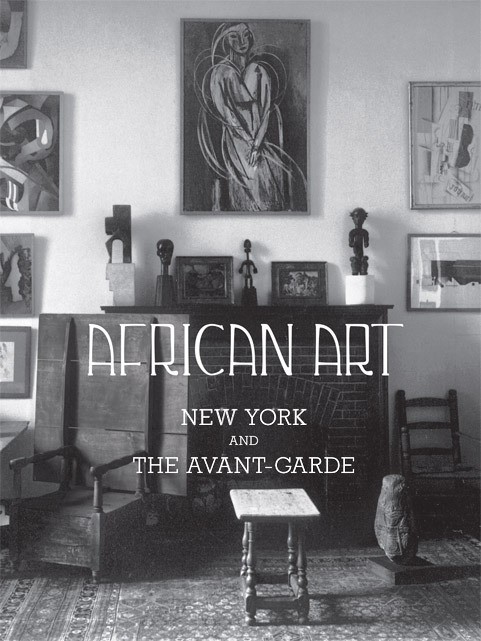 Nathan's vignette prompted me to post a quick reminder of The Met's recently opened show, African Art, New York, and the Avant-Garde, on view through April 14, 2013. We already know how strongly the pioneering artists of the early-20th century -- Picasso, Matisse -- were influenced by African sculpture and textiles but this exhibition looks at American collectors' responses in the 1910s and 1920s. In the States -- well, specifically in New York -- African art and artifacts could be appreciated anew, as abstract works of art rather than colonial trophies. The Met's show encompasses forty wood sculptures from West and Central Africa juxtaposed with photographs, sculptures, and paintings by Brancusi, Rivera, Picasso, Stieglitz, Sheeler, and Picabia. The Harlem Renaissance and its connection to African art is touched on in the exhibition, too. 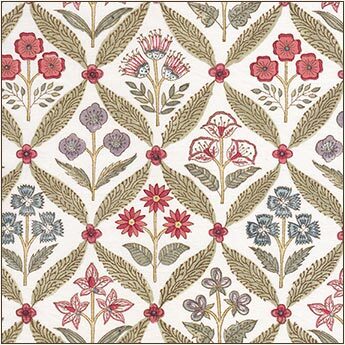 Maybe you've been wondering what's taking me so long to get to John Robshaw's new textiles book? Well, it's bigger than I expected -- in a really good way. Literally larger in format with gorgeous two-page spreads but also broad in scope. That it's entertaining and beautifully-illustrated is no surprise. I didn't know, though, how much it would delve into Robshaw's days as an art student. 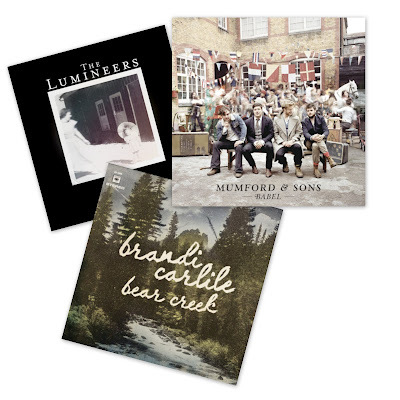 So I'm taking my time. Be back soon with more. 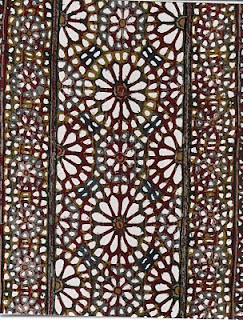 Let's start up close, with our faces practically touching Lisa Fine's new handprinted linen, then slowly back away to appreciate the large-scale design of Lahore. Its delicate leafy branches warrant attention. 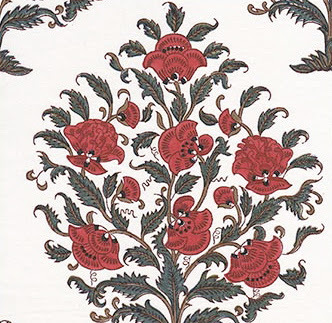 These myriad little botanical forms come together to create larger, scroll-y, teardrop or leaf-like shapes known as "boteh" or "buta" in Kashmir, India, and more commonly called paisley in the West. 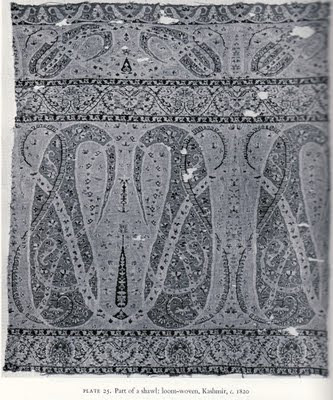 In his book, The Kashmir Shawl, textile scholar John Irwin charts the evolution of boteh from relatively crisp motifs regimented on a clean, open ground to wilder, exaggerated forms often comprised of countless densely-packed blossoms or leaves (essentially like Fine's design, above). Just as unrestricted ivy overtakes a brick wall, paisley can dominate a design to the point that we only see a hint of the ground color. If you had time to glance at last week's post, you know Lahore was inspired by a pashmina Fine noticed in a painting. It was, in fact, a Sargent portrait discovered in a book in India. 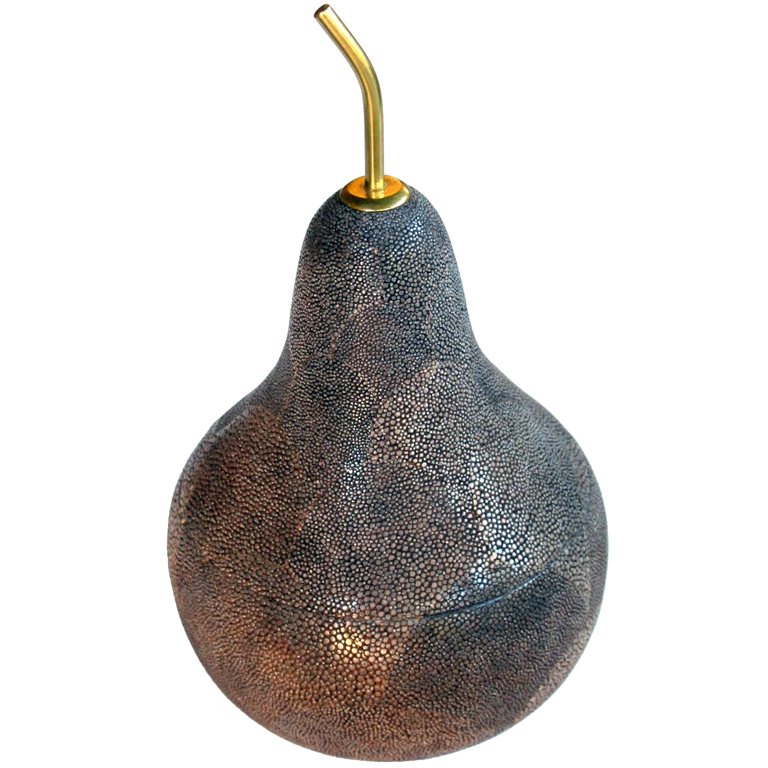 But not the one shown here. The piece that attracted Fine includes a shawl rendered in sharper focus. 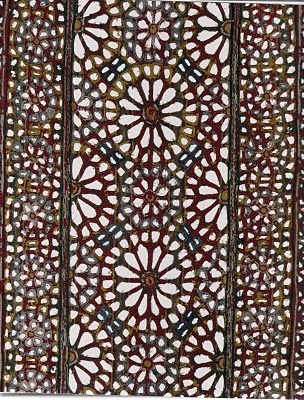 Although the botehs were big, elongated, and arranged in a similar style. 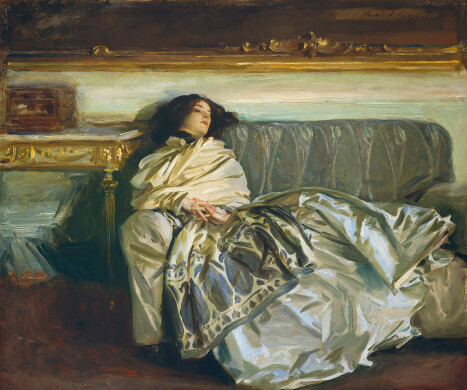 This early-20th-century Sargent painting, Nonchaloir, belongs to the NGA. It represents the period in the artist's career when he'd grown weary of accepting commissions for formal portraits and was painting to please himself. 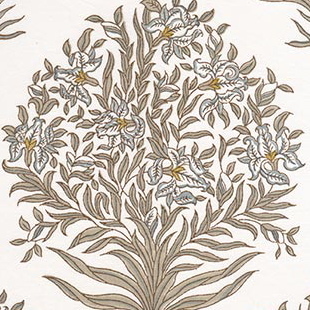 For her fabric, Fine chose four coloways: Monsoon, pictured multiple times above, Apricot, shown below, Rose, and Calico. 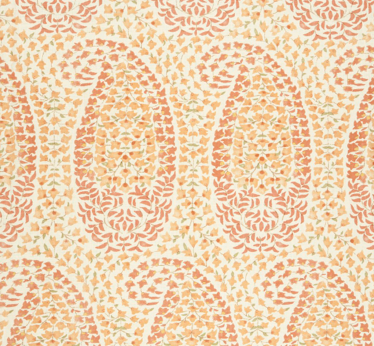 Fine also has a new print, Cairo, inspired by an ancient Egyptian textile but she told me that it really reminds her of ceramic tiles found in the Islamic world. 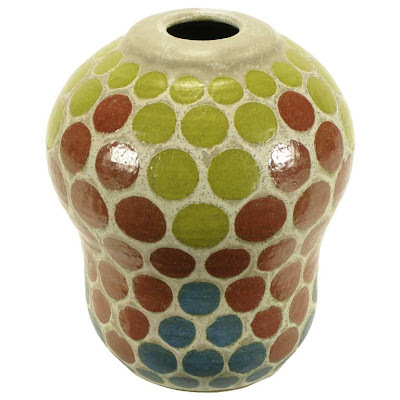 "The colors, Candy, Jungle and Iznik, are vibrant jewel tones," she added. And BTW, since Fine is such an animal lover, it seems fitting that she will offer dog mattresses in Cairo for her upcoming One Kings Lane sale on December 15. 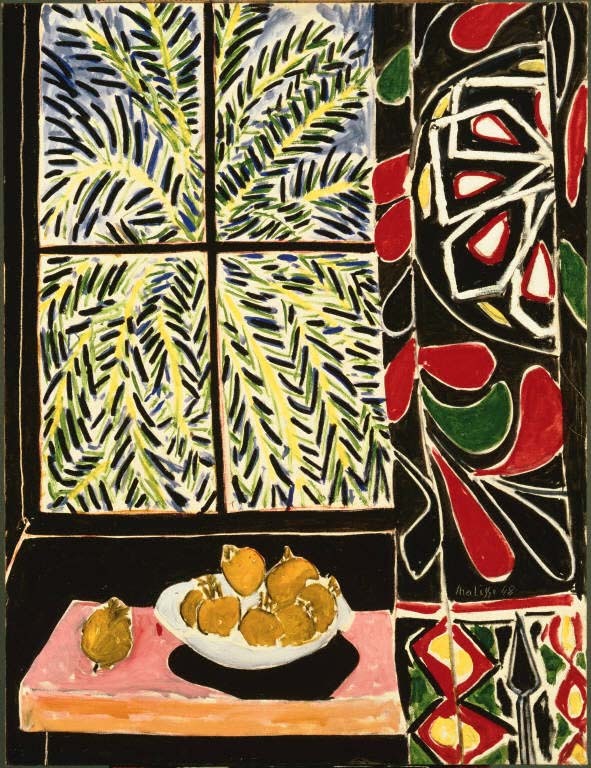 Related past post: Matisse's Egyptian Textile. 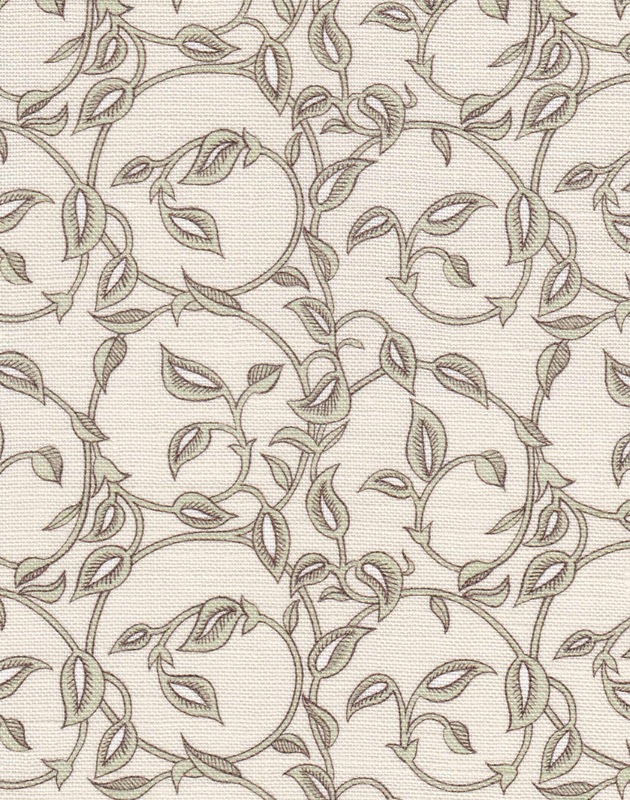 Soon I'll be taking a closer look at Lisa Fine's new hand-printed fabrics, including Lahore pictured above. 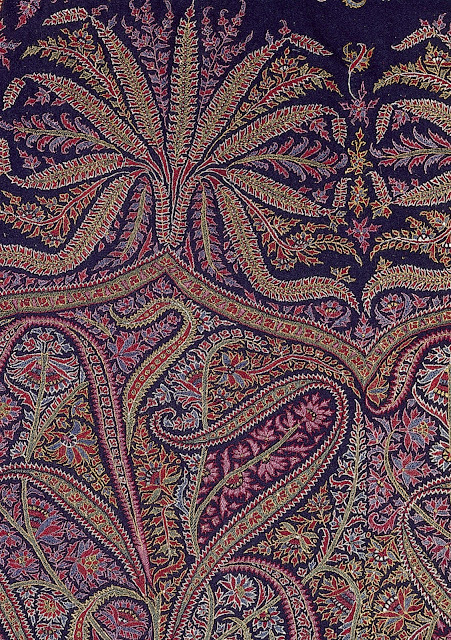 Although her elongated paisley design was inspired by a cashmere shawl she spied in a painting, the golden Indian one draped around Madame Recamier is not it. I'm posting this Fragonard portrait as a reminder to check out part three of Rosemary Crill's Cotton Road podcast. 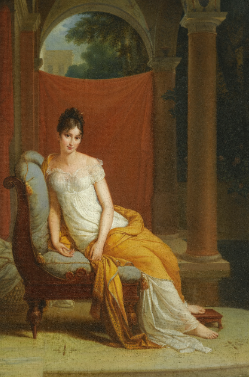 In the final installment, Crill talks about the Western heyday of finely woven Kashmir shawls -- the period when alluring women such as Recamier, Emma Hamilton (Admiral Nelson's mistress) and Empress Josephine paired them with airy muslin dresses. 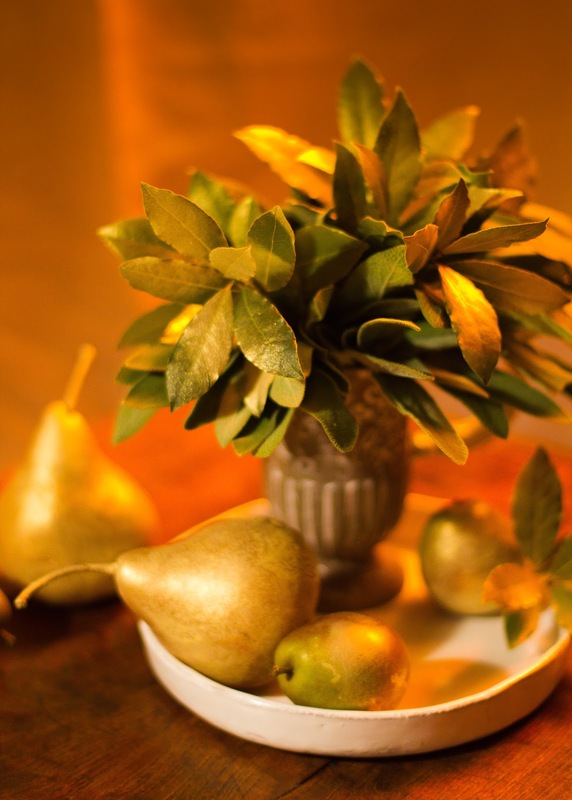 As much as he loves flowers, sometimes designer and event planner Matthew Robbins prefers to work with food. 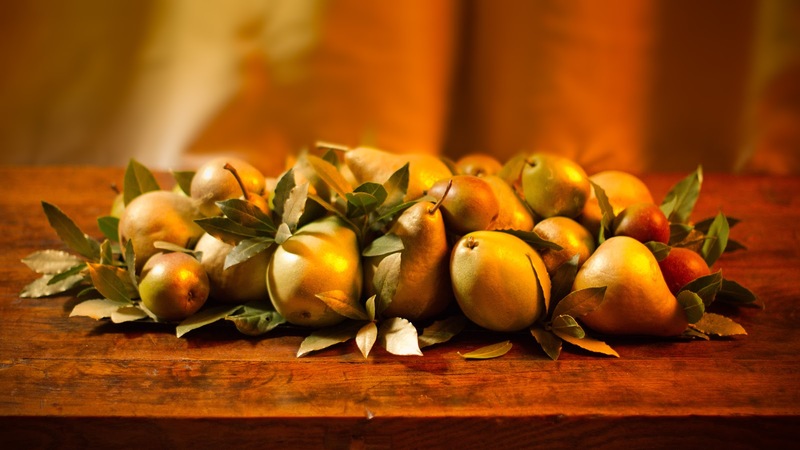 He might let the whole meal itself take center stage or simply pull together a rustic grouping of fruit and leaves -- no containers needed. 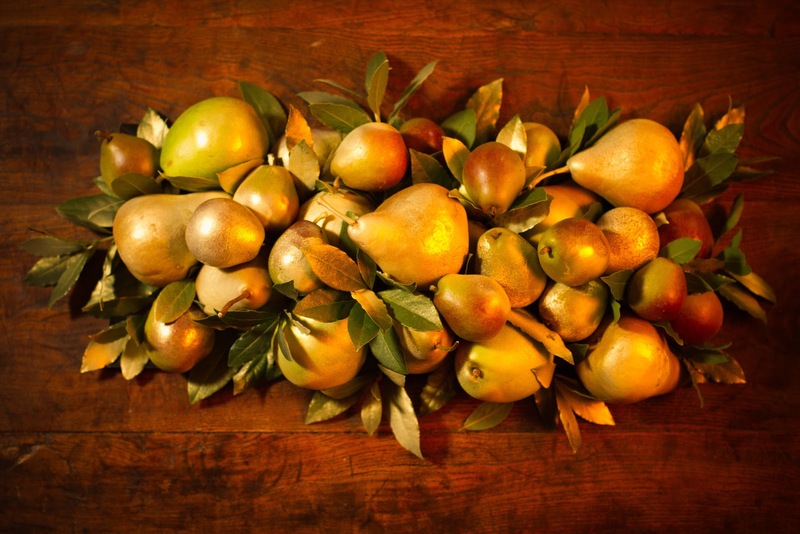 This year, he's gravitating toward the golds and greens of pears. And the still lifes he created, captured here so beautifully by Rebecca Thuss and Patrick Farrell, caused me to start noticing pears everywhere. Like this 1970s shagreen-covered box by Maitland Smith at Epoca. 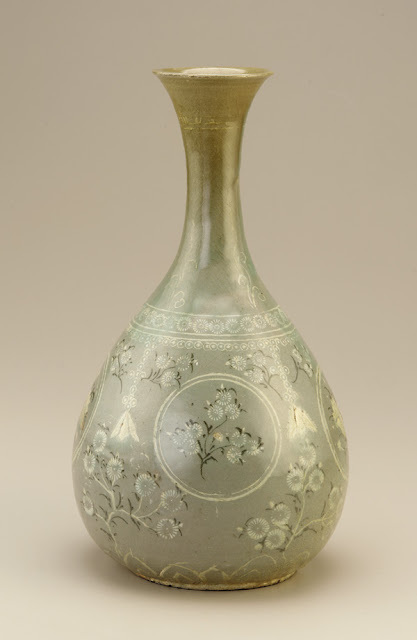 And Charles Lang Freer's pear-shaped Goryeo period (late 13th-early 14th century) Korean stoneware bottle with black and white inlays under celadon glaze. It's now in the collection of the Freer Sackler Galleries. Then there was this circa 1620 Japanese writing table at the V & A. According to the Museum, the materials are "wood, covered with gold and silver takamaki-e (high sprinkled picture) and nashiji (pear-skin ground) lacquer, with gold and silver details." 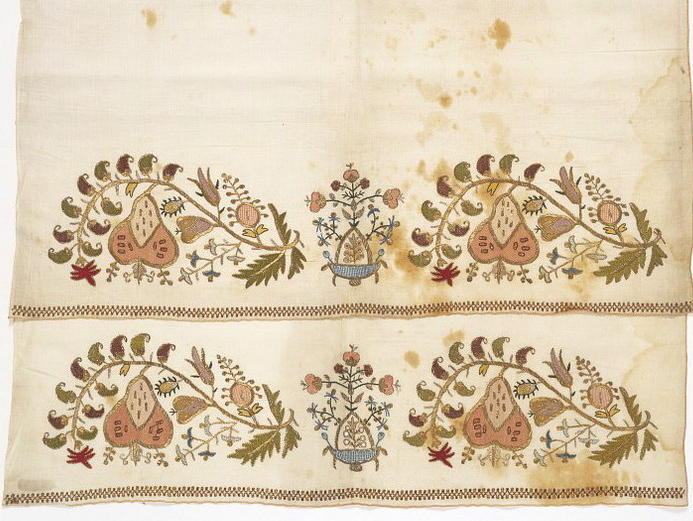 Pears popped up on a 19th-century embroidered Turkish towel, also from the V & A. 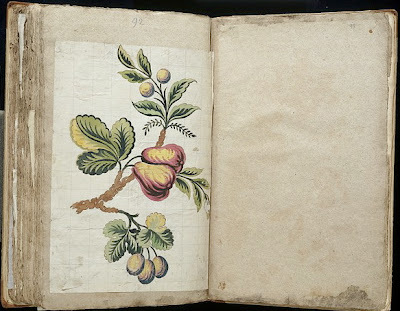 Although this branch with pear -- a design for silk weaving -- is thought to be French, it was found in the Leman Album, a leather-bound collection of 18th-century British weaver/designer James Leman's watercolor designs for textiles. The V & A says the seemingly uncomplicated design shows points rentrés modeling. Getting more abstract, a detail of an antique Anatolian rug with a striking pear-colored field via Galerie Shabab. And lastly, this late-1960s inverted pear-shaped ceramic vase by Japan's Tomiya Matsuda (1939-2011). [Click to enlarge. 16th-century porcelain tea bowl. Korean. Damaged goods never looked so beautiful. 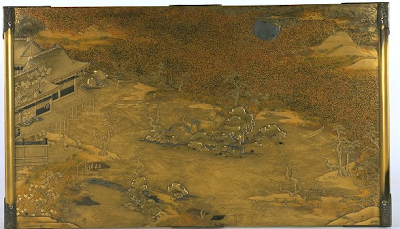 It's likely that this Asian bowl became even more luminous after the Japanese employed their favored technique of ornamentally repairing cracks or nicks with gold lacquer. 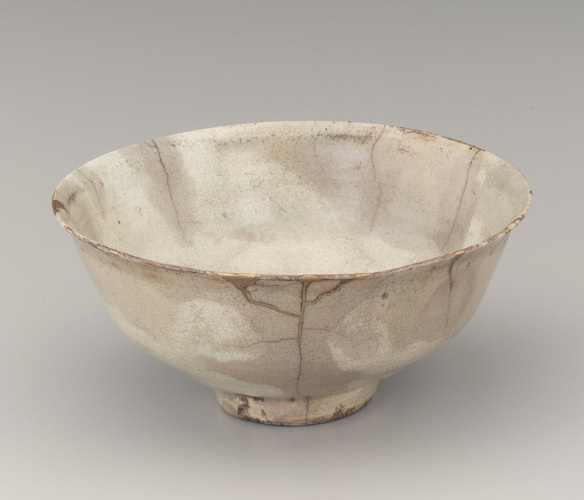 According to the Freer and Sackler Galleries in D.C., this roughly 460-year-old provincial ceramic piece made by a Korean craftsman was highly collectable in Japan. When used for tea the clay became discolored but the Japanese appreciated this mottled appearance -- this natural patina -- and as the bowl became more time-worn they highlighted its bumps and bruises by gilding them. To see some gorgeous examples of Korean ceramics with textile-like surface pattern, visit the Freer's new exhibition, Cranes and Clouds: The Korean Art of Ceramic Inlay. As it happens, this month the Arthur M. Sackler Gallery is celebrating its 25th anniversary. Loads of related events are planned the week of November 28. Learn more here. 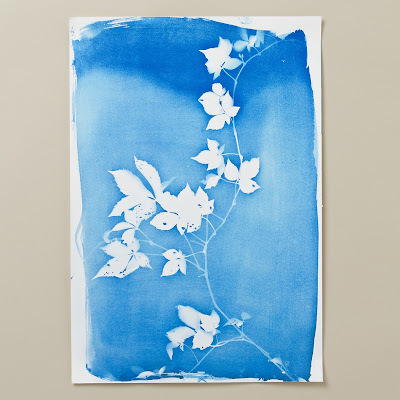 Although she didn't invent the cyanotype process, Britain's Anna Atkins (1799-1871) is credited with producing 1843's groundbreaking British Algae: Cyanotype Impressions, the first book illustrated solely with photographs. She is also generally acknowledged to be the first female photographer. Today her photographs -- well, to be precise her photograms -- are in the V & A's collection. 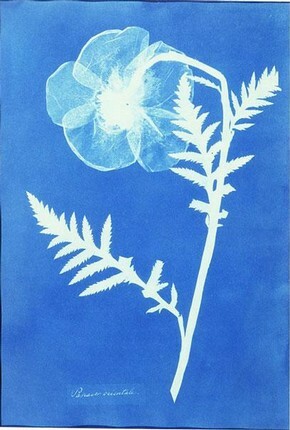 Photograms are made without a camera or film: the artist (or scientist) simply puts pieces of interest, for example botanical specimens, on light-sensitized paper and then exposes the treated paper to light. 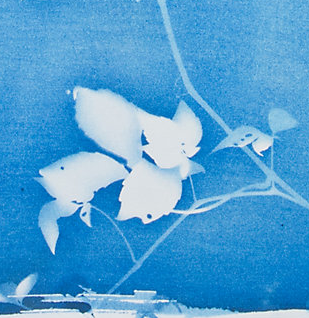 In short, this is the cyanotype process. Fast-forward about 170 years and across the pond to Athens, Georgia and find Rinne Allen continuing the technique with her Light Drawings. 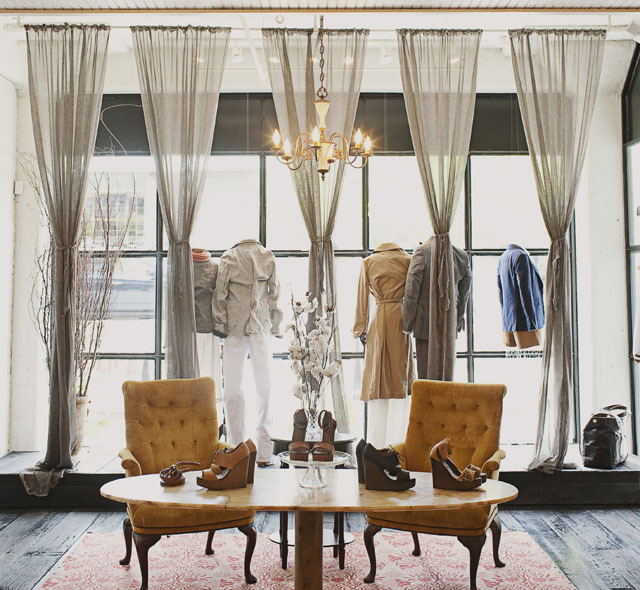 If you read Selvedge, you were probably swept away by the beautiful examples of her work in the latest issue. I was. In fact, the story inspired me to do a little research of my own. 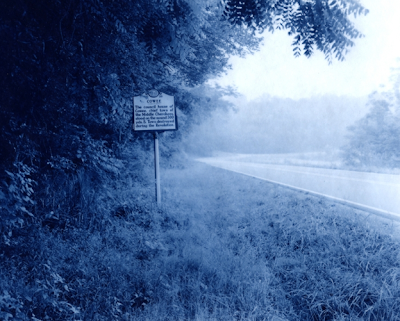 I've been learning about Rinne's work with Alabama Chanin and Hable Construction, as well as the cyanotypes. A related post will be up in a while but for now I'm popping in to help spread the word about Rinne's new limited edition prints available at Terrain. You can also take a peek at her bountiful Southern garden here. Many thanks to curator Shannon Morris for letting us know about another Georgia-based photographer, professor Emily Gomez, and her innovative cyanotypes which are currently on view through November 30 in Unearthed: A Photographic Search for Native American History at the Museum of Fine Arts at Georgia College. So I've ordered some bourbon balls to serve along with the pies, and while my patio camellias pale by comparison to the ones growing in Lin Backus' garden near Savannah, it looks like I'll have just enough to cut for the Thanksgiving table. Slowly getting in the spirit, I even asked floral designer Matthew Robbins to share with us his seasonal ideas. (Remember when we talked about his book?) His loose, unfussy gatherings of leaves and pears will be posted shortly. 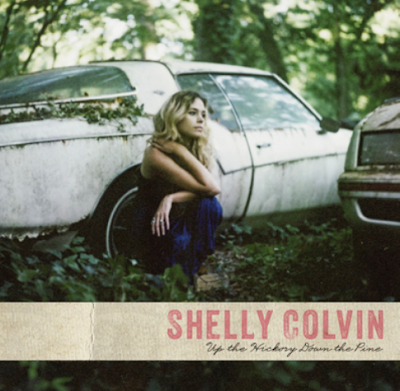 As I ordered those bourbon balls and emailed Matthew, I had Nashville-based singer/songwriter Shelly Colvin's debut album, Up the Hickory Down the Pine, playing in the background. Often compared to Emmylou Harris, Shelly is nonetheless an original -- a 21st-century musician simpatico with the laid-back rock/country sounds that came out of 1970s California. (And she can really work an embroidered tunic. When not on stage, the multi-talented woman is doing her day job as Artist Relations /Music Liaison/Stylist for Billy Reid.) This brings me to an exciting pre-Thanksgiving happening in Atlanta at Reid's Westside shop on Saturday, November 17th from 6 to 8 p.m.: Colvin's record release party. 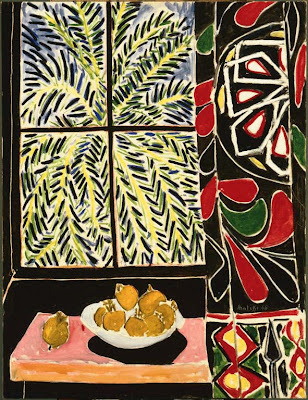 For The Met's upcoming show, Matisse: In Search of True Painting, The Phillips Collection in Washington, D.C. is loaning one of the artist's seminal textile-related works from a later but brilliant phase of his long career, Interior with Egyptian Curtain. It's part of a series of three paintings he did of his Villa Le Rêve studio in Vence and the piece was published, along with Interior with Black Fern and Large Red Interior, in Verve, fall 1948. The Met was interested in highlighting the trio because the paintings show how Matisse repeatedly explored certain subjects and how he tended to favor pairs and/or series of three. Essentially, this exhibition will be about process -- the idea that for Matisse the creative journey was perhaps as important as the destination. 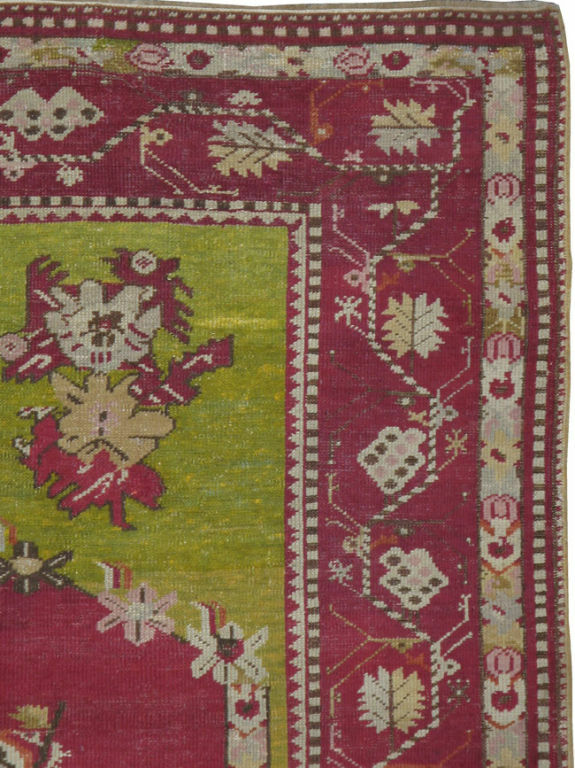 For Interior with Egyptian Curtain, he drew upon his own extensive textile collection, specifically the bold and colorful Middle Eastern appliquéd cotton pictured above. According to The Phillips, this painting could be considered his ne plus ultra (in this category of oils) and it's clear that the lively cut fabric on the Egyptian piece influenced his paper cutouts. 1948 was also the year he ventured further into abstraction with his work for the Dominican Chapel in Vence. In all, 48 canvases will be on view in Matisse: In Search of True Painting, which opens at The Met December 4 and continues through March 17, 2013. 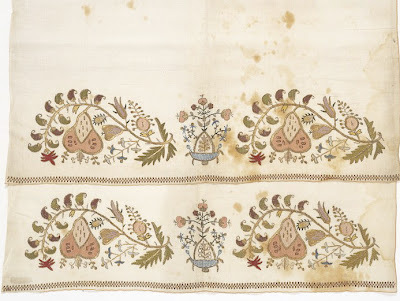 Past posts of interest: From Textile to Painting and Man of the Cloth. Following up on last week's post, here's a look at some new offerings from London-based textile designer Aleta Bartel-Orton mixed with Brigitte Singh's block-printed Indian cottons. 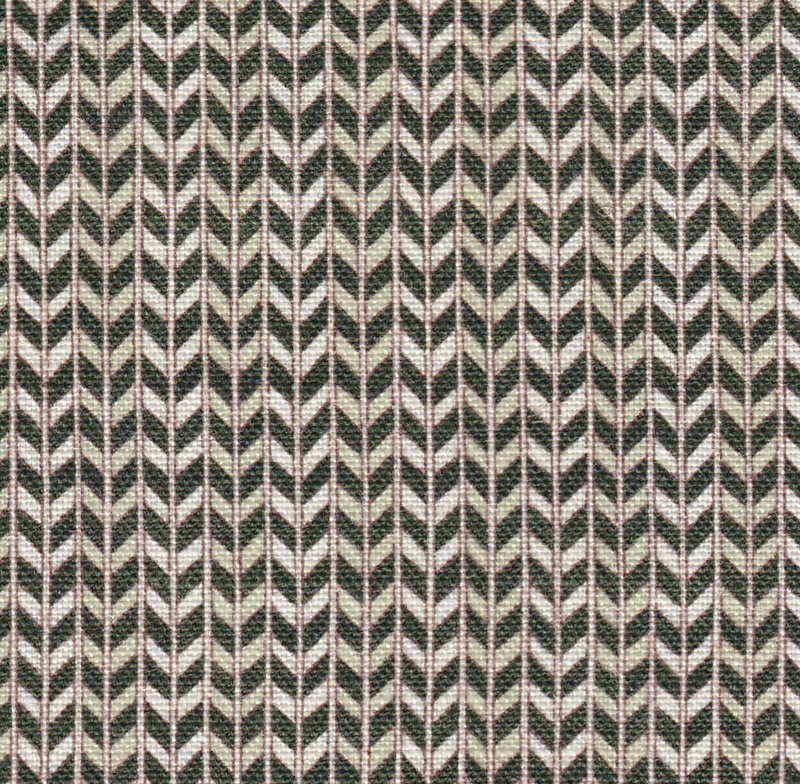 Nearly 10 years ago, Aleta designed her Lewis chevron stripe, pictured above on the far left. Initially she thought it would serve as a crisp counterpoint to her wilder florals -- and it still does -- but, as she recently posted in the news section of her site, Lewis has become her most asked for pattern. It stands on it's own. 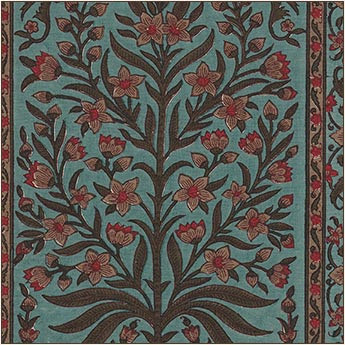 And while the fabric is available in different blues, red, pink, and grey, Silver-Green is the most popular option. 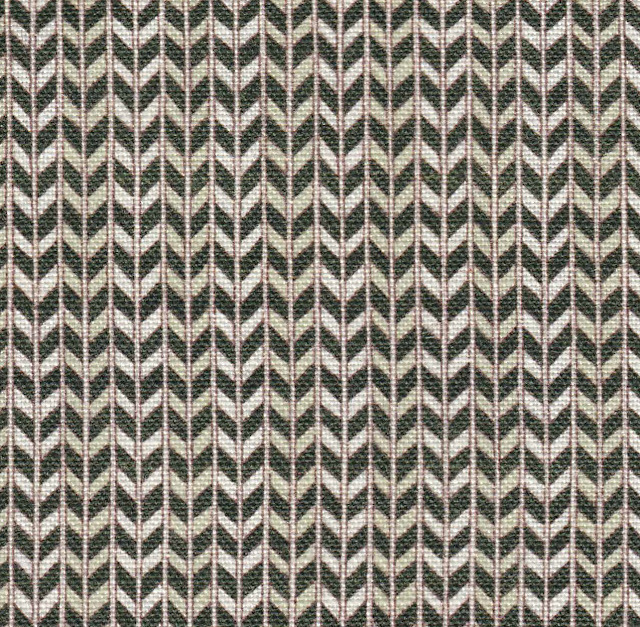 Now this made-in-the-UK chevron stripe, as well as Aleta's undulating Silver-Green Georgie (shown lower right, above), may also be ordered on heavy-weight linen. Both look great with Singh's Papavero on White (clockwise from the top, it's the first floral above) and Cypress on White (the stylized trees sandwiched in the middle). If you're hunting for discontinued prints or well-priced remnants, check out Aleta's special offers. She's begun adding pieces and tells me that more will be posted next week. 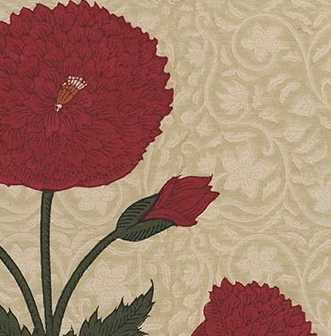 Also on its way: Singh's Pavot on Green, a big sister to the original Pavot made with a different woodblock. 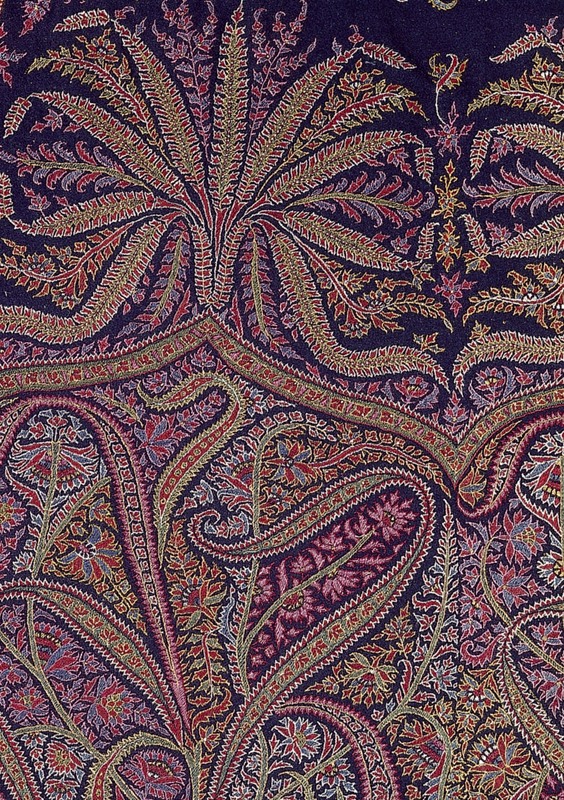 This psychedelic paisley pattern was embroidered with silk threads on woven goat hair in Kashmir. 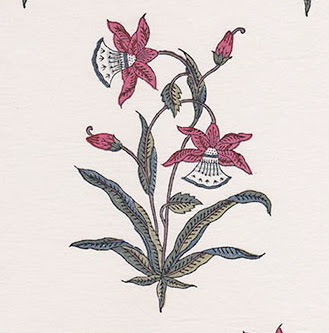 It was made specifically for the Western market -- for a man to wear -- and it's a great example of how the boteh motif (a cone-like botanical) really went wild during the mid-19th century. So wonderfully overgrown, in fact, that the elongated and exaggerated forms obscure the ground color. The profuse, brilliant pattern also foreshadows that quintessential 20th-century menswear accessory: the silk paisley tie. I came across the textile in one of my all-time favorites from the V & A Pattern Series -- Indian Florals by Rosemary Crill. But new titles are on the horizon. 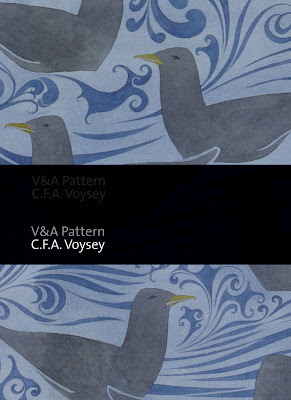 C. F. A. Voysey is scheduled to be released next year. 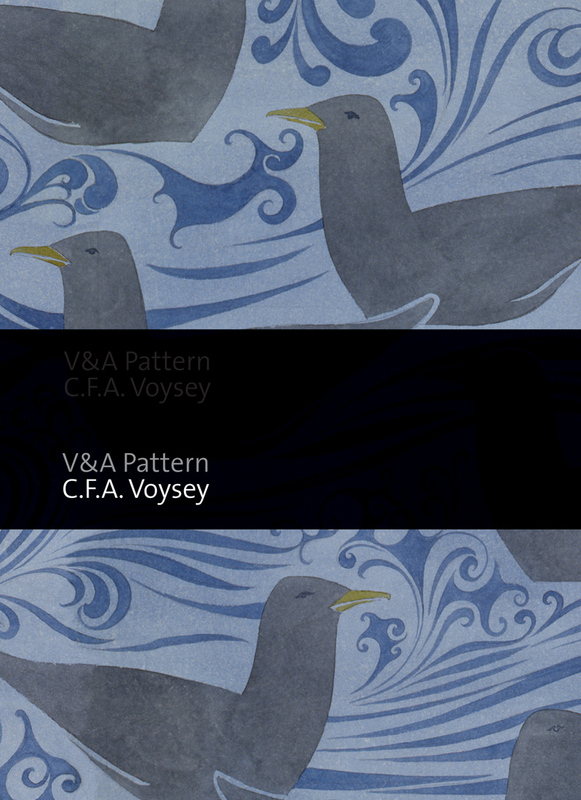 Especially known for using stylized birds, animals, flowers and trees in silhouette, textile designer Voysey began his career as an architect. He was a major force in late-19th century design, with clients including the manufacturers Liberty and G. P. & J. Baker. 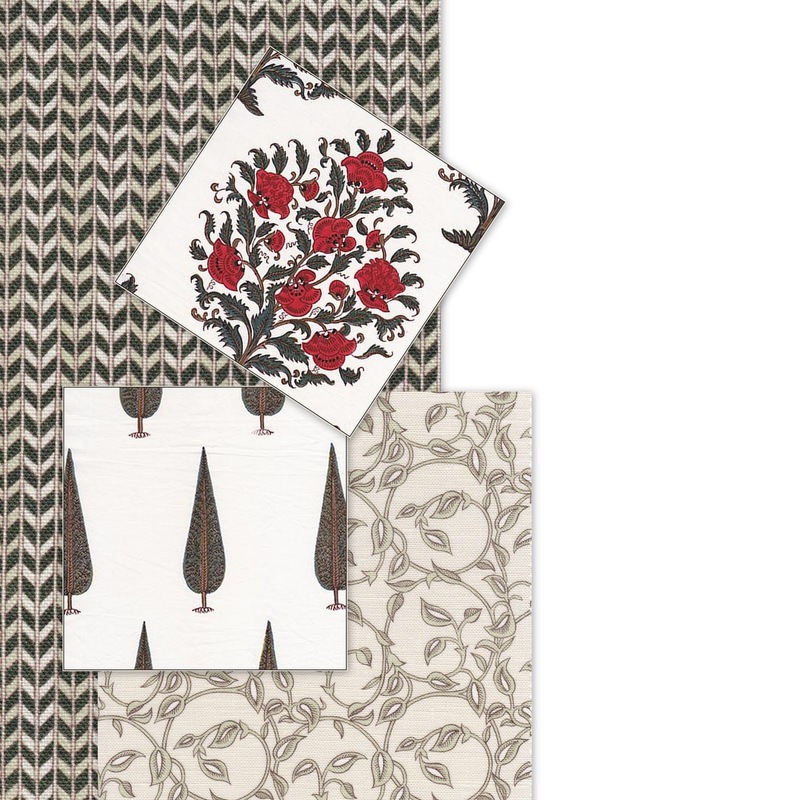 BTW, the V & A's adaptations of his Deer in the Forest, 1918, and Bird and Holly, circa 1897, are available again this season as holiday cards and wrap in the museum gift shop. Those copper pots. The butcher block. 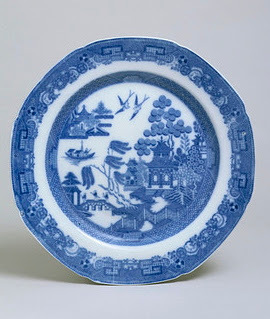 Her Peg-Board, blue-green cabinets, Spode Blue Willow plates and collection of books. All of these elements plus the hundreds of tools, furnishings, assorted objects, Garland range and other appliances that comprised Julia Child’s no-frills kitchen will be on view in FOOD: Transforming the American Table 1950-2000, an exhibition opening November 20 at the Smithsonian's National Museum of American History in D.C.
As you probably know, back in 2001 Child gave the museum her entire kitchen -- the iconic East Coast one from her Cambridge, Massachusetts house. 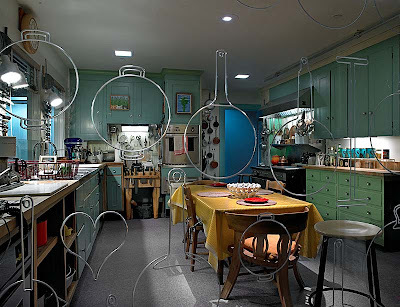 Later, when it appeared on screen in this 2009 movie, there was renewed interest in the idea of not-so-precious kitchens. (Seems to me her efficient Peg-Board wall in particular, with its simple yet graphic display of pots, generated a lot of blogosphere talk.) During the past year, conservators and museum volunteers have been dismantling Child's now very famous kitchen in preparation for its re-installation as the exhibition's opening story. The show will be the Smithsonian’s first major exploration of food, and Child will be highlighted as a serious force in the evolution of American food culture. Learn more here. Feeling lucky to be in a safe, dry, warm spot with my personal possessions in tact, I started going through a box of saved notes. Among the kept holiday cards (a total mix of really visually interesting cards from folks in art and design stashed with mostly sentimental things), was a beautiful piece of stationery designed by Aleta. Seeing it again inspired me to post a quick reminder about the latest Brigitte Singh prints and colorways, distributed in the UK and US exclusively by Aleta Ltd. I think many of you already know that Aleta Bartel-Orton is a talented textile designer in her own right. 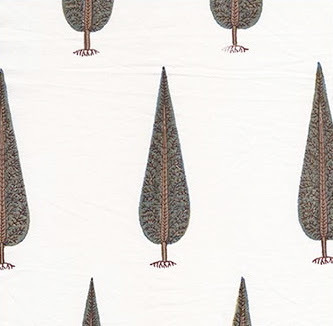 In part because her company distributes Singh's wonderful hand-block-printed cottons and interiors collection, Aleta's name is practically synonymous with wares inspired by 17th-century Mughal-Indian style.